The Resident Evil series has seen its share of ups and downs in the twenty odd years it’s been around. From the first adventure in the Arklay Mountains to Leon Kennedy’s ill-fated mission in rural Spain, it’s traveled the globe and brought gamers numerous scares and inconceivable horrors through both slow-paced, tense gameplay as well as frenetic action sequences. Resident Evil 7 is a defining development for the Resident Evil series’ timeline. 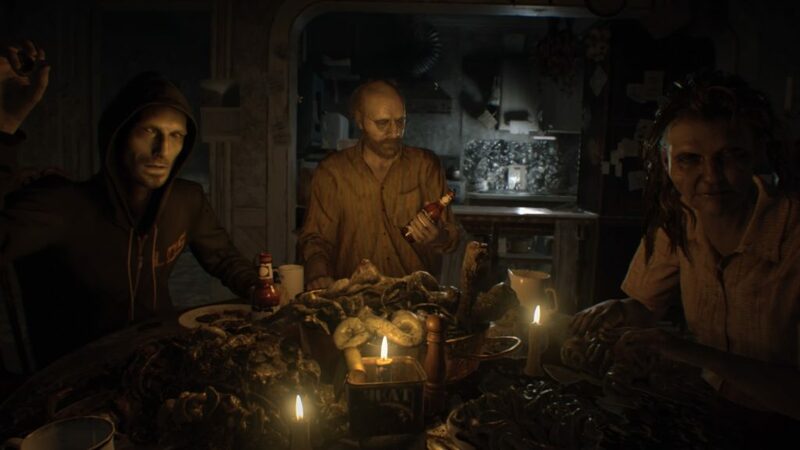 Much like when Capcom reinvented the survival horror staple with Resident Evil 4’s significant combat overhauls and game design changes, Resident Evil 7 took a look at the current climate where gaming and technology intersect and made a call to pause the series’ previous direction to diverge the path into something new—and much scarier. Taking heavy cues from recent horror games like Outlast and Penumbra, Resident Evil 7 was built as a first person horror without immediate ties to the previous games and their lore. While the story doesn’t immediately echo previous Resident Evils—there are no Valentines, Weskers, or Kennedys to be found as leading stars—it still pays homeage to the series by opening up with another estate reminiscent of the inaugural game’s sprawling Arklay mansion and its grounds. While on a search for his missing wife Mia, the protaganist Ethan is drawn to a derelict house in the backwaters of the South. He quickly finds himself in a fight for his life against its inhabitants: twisted characters cut straight out of a Rob Zombie film, psychotic and deranged with a dark sense of humor and an unnerving penchant for torture. The patriarch of the hillbilly clan, Jack Baker, is all too eager to welcome Ethan to the family with his chainsaw. The first hour of the game pitches Ethan against the Bakers in a game of cat and mouse while players absorb the enormity of the situation they’re in. Armed with little more than a combat knife at times, gamers control Ethan in a house of horrors while trying to escape. A mysterious phone call from a lady with a southern drawl known only as Zoe offers insight into the situation along with scattered documents, pictures, and newspapers. People in the area have been going missing and it seems some of them have been experimented on, perhaps even eaten. Where other Resident Evils rely on monsters to provide a constant threat, Capcom chose to draw inspiration from the third installment which featured Jill Valentine being chased relentlessly by a creature known as Nemesis. Jack Baker becomes a human version of the Nemesis, providing a much creepier take through his humanity. Baker taunts Ethan as he chases him and he isn’t able to be killed. As he goes deeper into the house and works to uncover the mystery of who the Bakers are—and, perhaps, what they have become—he is forced to avoid the murderous patriarch and immediately learns to fear every shadow. Eventually, other enemies are introduced and the house expands into a full estate as the story progresses. The previous elements of Resident Evil titles are slowly introduced and Ethan gradually goes from a knife to eventually a grenade launcher. But what really stands out in Resident Evil 7 is how scary it actually is—and how strong its environs are. The Bakers are a captivating family with an unnerving dynamic, the mansion they inhabit a creepy place, and the resulting tension is thick. For the first time in over a decade, the Resident Evil series is truly scary for an extended period of time. Players will be scared of every corridor, every noise, and every flickering light. In short, Resident Evil 7 is a brilliant game. It aims to scare its audience and it does so with aplomb while simultaneously weaving an interesting story through a haunting environment to explore. It takes RE back to its roots and it is one of the best horror games we’ve ever played. If this is the direction the series is going on, it’s the first time we’ve been excited for it since Resident Evil 5. Disclosure: A copy of the game was provided for review.